I have to admit that I have always been drawn to the 800 Building. That towering blue mess on the corner of Fourth Street and York Street in SoBro has, for years, been a shadow of its former self, but it’s so easy to see how it wasn’t always this way. 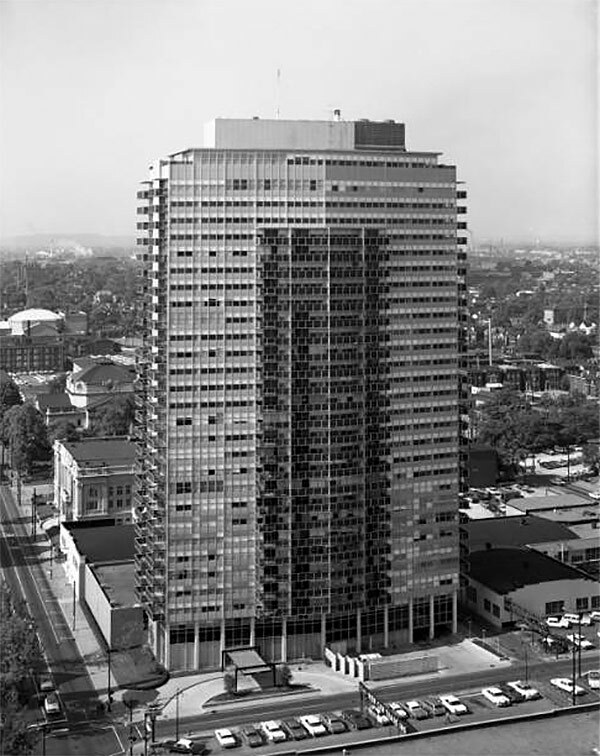 Fifty years ago this thing was at the height of Mad Men glamour as one of Louisville’s ritziest addresses. It was more like 1400 Willow is today, but way more modern. Arrasmith’s hexagonal design for the 800 brought with it the city’s first curtain wall for a residential building (and only the second curtain wall period in the city after the Liberty National Bank building). Clearly, the most distinctive aspect of the building is its bluish turquoise metal panel curtain wall, which was the result of a special deal with the Reynolds Metals Company, according to the Louisville Guide. 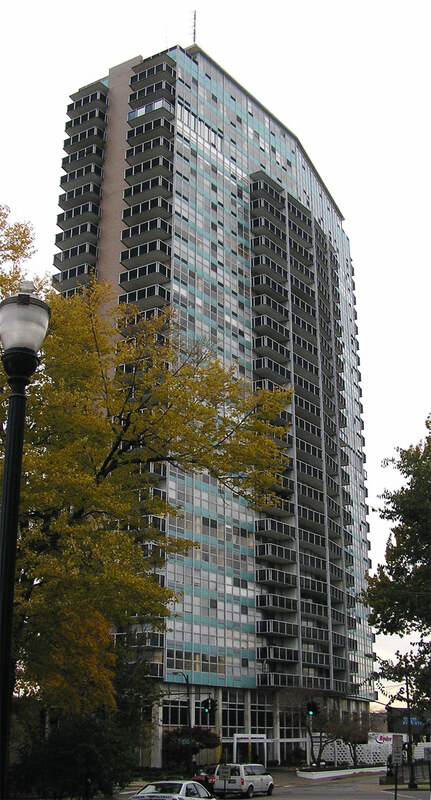 At 290 feet tall, it stood as the city’s tallest tower for eight years and then as the tallest residence for another 33 years after that, eventually being supplanted by the PNC Tower and Waterfront Park Place, respectively. Arrasmith’s firm collaborated on the project with Chicago’s Loewenberg & Loewenberg. Yet while the 800 promised luxurious modern living in Louisville’s core during a period of mass suburbanization, the tower couldn’t keep up with the level of disinvestment going on all around it. Over the years, however, the tower has had its ups and downs, and by 1997, the tower sold for less than $4 million—well under the $6 million it cost to build it in the first place. After passing through several owners and undergoing piecemeal renovations and upgrades along the way, it looks like the 800’s fortunes are looking up once again. A new developer has announced ambitious plans to invest $10 million into the property, overhauling the building’s interior and restoring it to its former glory. Detroit-based Village Green has been eyeing the building for months now, but just closed on the building last month, nabbing it from Chicago-based Leon Petcov for $20,650,000. 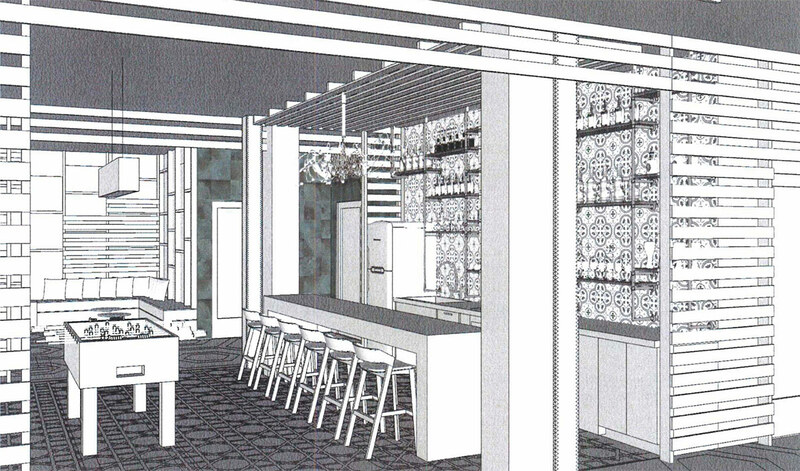 Now, plans for the 800’s renovation are coming into focus, and it looks like Village Green intends to keep the building’s distinctly modern feel intact. To achieve this global modern aesthetic, Village Green is revamping the building from the ground floor all the way to its rooftop amenity decks. 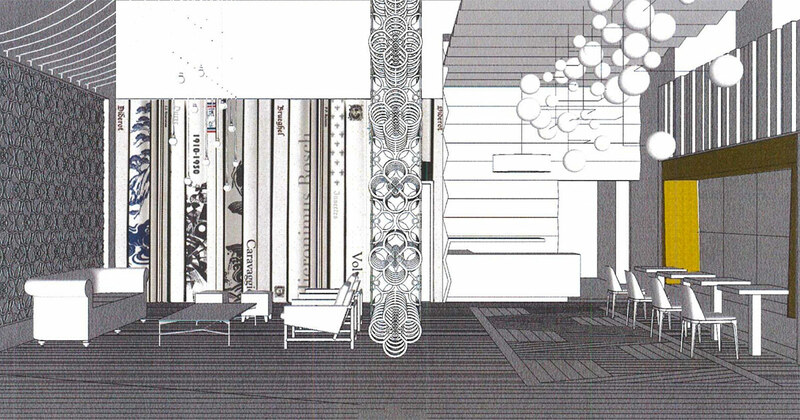 New landscaping, a new entrance, and a “boutique” lobby are planned on the ground floor. A restaurant or cafe could be located off the lobby, and residents will have access to a movie theater, conference rooms, concierge services, and a business center. Up top, a 29th-floor “Sky Club” will include a kitchen and dining room and a lounge with a fireplace. 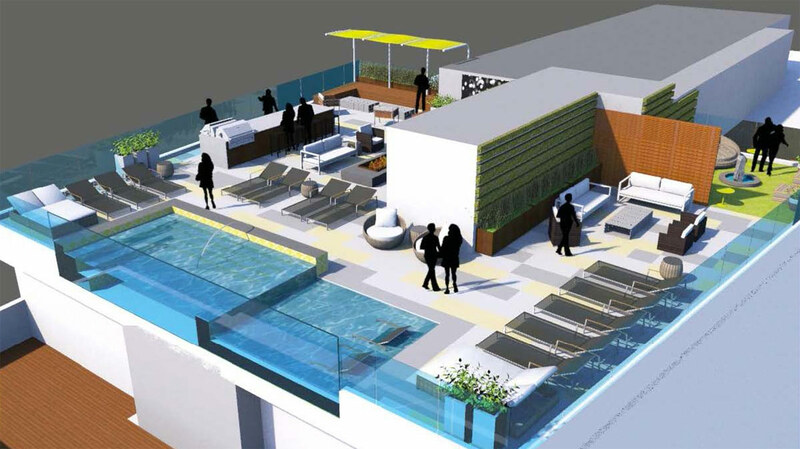 An outdoor “Sky Park” includes a terrace with grills, a swimming pool, sun deck, bar, and fire pit. More visibly, the building’s metal panels will be restored to their original blue. Besides these cosmetic and amenity changes, the 800 is also changing names. Developers haven’t yet unveiled their new marketing strategy, but this is Louisville, so the building will be known locally as the 800 for a long time to come. 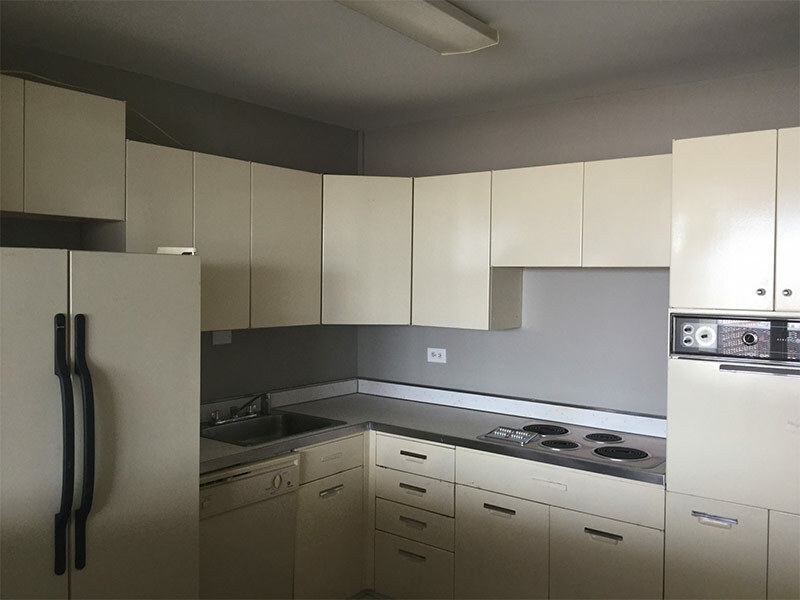 Inside the building, many of the units still include finishes dating to the 1960s, including original metal cabinets. All of that will be replaced with modern appliances, granite counters, and other design elements common to upscale buildings in Louisville. The previous owner has already upgraded the building’s major infrastructure—heating, cooling, sprinklers, and elevators—Business First added. The building is about 70 percent occupied, reported Business First at the end of June, and current tenants will have options to remain in the building if they choose. Rents at the tower will range from $730 to $2,025 per month for one and two-bedroom units, according to Village Green. One critical component of the project—an increase in density—still needs approval from the Louisville Metro Planning Commission. Developers plan to break up the building’s largest units—those with three and four bedrooms—that have proved difficult to lease. By converting that space to one bedroom and studio apartments, Village Green will increase the number of total units from 247 to 289. Last week, a committee of the Planning Commission “endorsed what’s called a change in density to allow the high-rise to increase its number of units,” according to a report in the Courier-Journal. Next, the full Planning Commission will take up the project on Thursday, July 30 at 1:00p.m. in the Old Jail Building (514 West Liberty Street). 1) Please don’t say “SoBro”. It’s even worse than “NuLu”. 2) The air conditioning was not repaired, at least not for all tenants. Why does it look like a bunch of blue tiles are missing at random? What did it look like when it was first constructed? @Maureen: Check out the black and white photo up top. It was taken a year after the building opened and shows much more consistency in the facade. It looks like pieces were altered over the years and unflattering air conditioner units were also installed through the blue facade, causing it to have much more patchwork appearance. It will be interesting to see how developers plan to address this in the renovation. I wish them much luck drawing tenants to the area. I work about 3 blocks from there and the area has become dense with vagrants, rehab clinics, pill mills and all sorts of sketchy characters. My daily walk to my workplace is usually interupted by a vagrant begging for money. This area has gotten alot worse, in that regard, in the last few years. I hope they have taken that into consideration. I love the building up the street as well. There’s a Chevy dealership there. Anyone ever see the movie ‘Money Pit’? I have moved into the 800 recently. Love the building, the view and the history. Very very excited about the future here. Do you prefer working utilities? This isn’t the place for you. Unfortunately, it’s about that straight forward. The heat in the building cannot maintain a legal level on cold days. The legal requirement in the city of Louisville is that habitable units must maintain a temperature of 65 degrees between October 1st-May 1st. Our unit is 57 degrees today. This is a violation of the law. As others have mentioned, the water is shut off on nearly a weekly basis. Move somewhere else. 1) Do you like to smell your neighbors smoking cigarettes and weed through the unfinished holes in your walls? 2) Do you like endless construction? 4) Do you like roaches in your pantry? 7) Do you prefer a first floor common area that is the same temperature as the outdoors, but more drafty? 8) Do you like small, nearly impossible to get in to parking spaces? 10) Do you like issues being communicated to you in timely fashion? 11) Do you like being communicated with by staff at all? Here is the reality. This “renovation” is lipstick on a pig. DON’T FALL FOR IT. This building needs a real upgrade, not some linoleum flooring and a 3 foot pool on the roof. They proudly tout the “$11 million” renovation. Humorously, the same week of their “Grand Opening” (a press event, not the end of construction), the renovated Holiday Manor Kroger reopened after a $16 million renovation. How much of an upgrade can you expect with 2/3rds the budget of a grocery store renovation??? Don’t fall for it. Move somewhere else. LISTEN TO THE REAL RESIDENTS. DON’T MAKE THE MISTAKE WE DID!! Finally, if you have viewed an apartment and they are pressuring you by claiming that they are filling up, don’t believe the lie. I recently saw numbers that indicate they are under 60% to capacity. They aren’t filling up fast, and the current residents are dying to leave. Please move somewhere else.